President Rivlin hosts Rosh Hashanah reception for foreign ambassadors and members of the diplomatic corps serving in Israel. 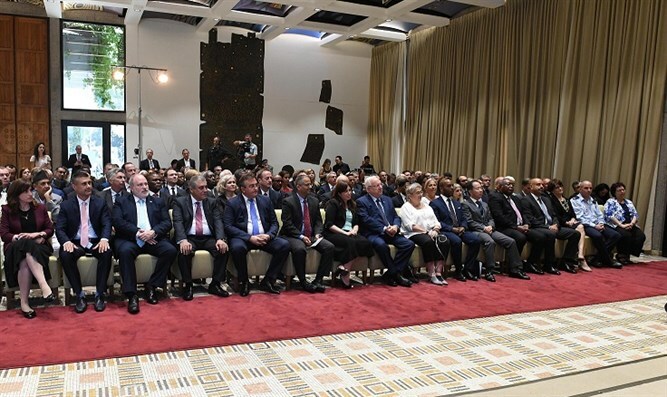 Israeli President Reuven Rivlin and his wife Nechama on Monday held a pre-Rosh Hashana (Jewish New Year) reception at the President's Residence in Jerusalem. Attending the event were various foreign ambassadors and members of the diplomatic corps serving in Israel. “As I told United Nations Secretary General Antonio Guterres a few weeks ago, international cooperation and national patriotism do not contradict one another. No one understands this better than us Israelis. The State of Israel – where the Jewish nation fulfills its right to self-determination – was established with the strength, of wide international recognition at the UN. Rivlin also said Israel desires to strengthen its diplomatic and trade ties with countries around the world. “This year is the 70th anniversary of the creation of the State of Israel. What you have managed to do here against all odds is nothing short of a miracle,” Diplomatic Corps Dean and Dominican Republic Ambassador Alex De La Rosa Garabito said. Concluding his speech, Garabito expressed hope that the New Year would bring renewed peace efforts between Israel and the Palestinians.